John Lewis' Graphic Memoir Wins 4 American Library Association Awards : The Two-Way March: Book Three, the third installment in the civil rights leader's memoir, won the Coretta Scott King Award for best African-American author. The Caldecott and Newbery medals also were announced. 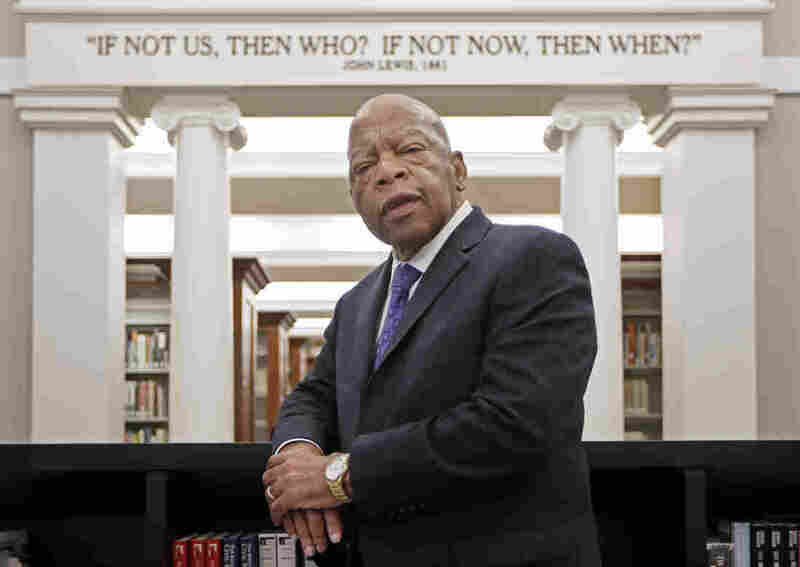 Rep. John Lewis stands in the Civil Rights Room in the Nashville Public Library in Nashville, Tenn. The American Library Association announced Monday that the Georgia Democrat received four prizes Monday for March: Book Three, the last of a graphic trilogy about his civil rights activism and winner last fall of a National Book Award. Lewis' book also won three other awards from the library association — the first time an author has won that many awards in a single year. In November, March won a National Book Award. But more recently, it was in the news after Lewis questioned the legitimacy of President Trump's election. Trump later tweeted that Lewis is "all talk — no action." That provoked a passionate defense of the congressman from Georgia who has worked his entire life for civil rights — and helped push his book to the top of Amazon's best-seller list. A Coretta Scott King Award is also given to the best African-American illustrator, and this year's went to Javaka Steptoe for Radiant Child: The Story of Young Artist Jean-Michel Basquiat. Steptoe also won the prestigious Caldecott Medal for the most distinguished American picture book. His book tells the story of Basquiat who began his career as a graffiti artist, rose to prominence in the 1980s and died at the age of 27 from a drug overdose. The Newbery Medal for outstanding contribution to children's literature went to Kelly Barnhill for The Girl Who Drank the Moon, a fantasy novel for middle school readers. A review in The New York Times compared it to such classics as Peter Pan and The Wizard of Oz. Books that win the Newbery and the Caldecott sometimes do go on to become children's classics. Past winners of the Newbery include A Wrinkle in Time and Bridge to Terabithia. Caldecott winners include Make Way for Ducklings, Where the Wild Things Are and The Polar Express.